Based at Arbroath after joining the Fleet Air Arm, Eric Brown was entrusted with a prototype of the proposed naval version of the Spitfire. 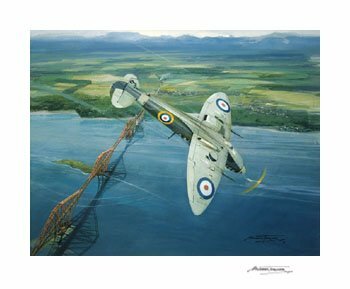 Called the Seafire, Eric flew it over the Forth Bridge, where he was unable to resist an urge to loop it under all three spans in turn before returning to base. Gicl閑 Print published from a gouache painting by Michael Turner. Each print individually printed to order on very high quality heavyweight paper, and then signed on the border by the artist. Sizes given are approximate and include a border.